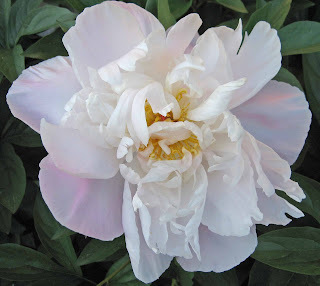 A pretty bloom goes a long way toward making the gardener forget the plant that bears it. At least that's true in my garden. Then fall comes and I don’t do it, and then spring comes and I’m too busy. Then it blooms and I repeat the process. So I live with this ‘Charlie Brown’ shrub for fifty weeks of the year because of two weeks of bloom. The lilac, at least the common lilac, Syringa vulgaris, is another shrub that gives us two weeks of heavenly scented fragrant blooms. The rest of the year? It’s a big ugly shrub. We should expect that with a botanical name like “vulgaris.” Mine needs to have some other shrubs planted around it to camouflage it. I'm working on that, don't rush me! 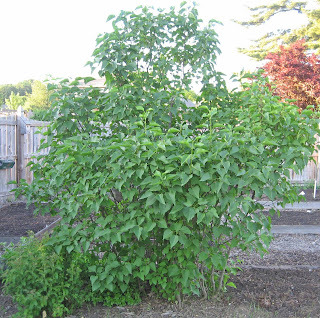 By the way, there are other lilacs that you can plant that don’t look like dogs when they aren't blooming. May I recommend Syringa patula ‘Miss Kim’ or S. meyeri? You’ll like them, I promise. 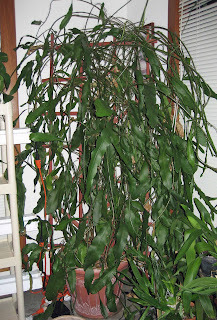 My night-blooming cereus is also a plant that only a few could love when it’s not in bloom. It’s all stems. But the bloom is an event and I think it is worth having this plant “own” a corner of my sunroom for that once a year, or if I’m lucky, twice a year bloom. Yes, you can "oh and ah" over it, because it is pretty, very pretty, "other worldy pretty". 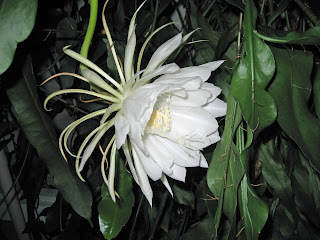 If the bloom wasn't so pretty, why would I put up with my big night-bloomer plant for years before it got all pot bound and started blooming annually on a regular basis (if two years in a row is a 'regular' basis). 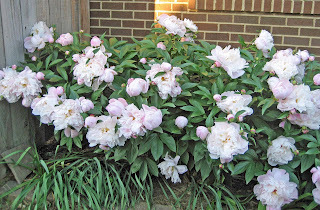 Some people think the peony plant is an eyesore once the beautiful bloom is gone. I don’t agree that it’s an eyesore, if you remember to deadhead the spent blooms once they’ve started to turn brown. Yes, I admit I have some scraggly looking plants in a few places in my garden, but about the time I have a WOO (window of opportunity) to cut one of them out, it blooms. And I would never cut down a blooming plant. Would you? I chopped my cosmos in half last year because they were just too freaking tall and they were in full bloom at the time. They bounced back and got too tall again in no time. And I'll do it again this year if I have to. Wow, that comment posted itself. Here's one with my info because Heather is as good as anonymous. I wouldn't cut a plant down in bloom. But I did cut a lilac back when it was almost done. Must of shocked it because this year it refused to bloom. Someone mentioned on my blog that they didn't like iris because the bloom doesn't last long enough then you have all that green grassy looking foilage. I guess it just depends upon what you like in a bloom. To me they are worth the space in the garden. Just as the space for those ugly Vulgar lilacs and the spindly looking mock orange get to claim their space in the garden because of the wonderful fragrance they exude which makes me forgive their vulgar spindly growth. I forgot I had Mock Orange until it bloomed this year....it blends in with the other hedges. The blooms were really lovely. We never prune it (except dead branches) and it has begun to drape very nicely over the garden gate. I have a vulgar Lilac and try to ignore it when it isn't blooming! I've planted annuals beneath it, we'll see. My son gifted me this plant so it can't be chopped down. Carol, why don't you underplant your mock orange and your lilac with something else that looks good when those aren't in bloom? From your pictures, it looks like you could do that and it might help you like them better! I know what you mean, though. I wonder why I still have some plants growing here, too. I don't think I could get rid of something when it's blooming but I don't have much of a problem yanking it out otherwise. Ralph, on the other hand, thinks that an unwanted plant should just be moved to another location. What is the point of that I ask you? We do have a Star Magnolia who's only saving grace is that it produces a beautiful bloom at the very beginning of spring. After that it's just a scraggly bush but I'll keep it since my sister-in-law gave it to me. Never say never - I think I have & I might again cut down something in bloom, but I'd rather not. 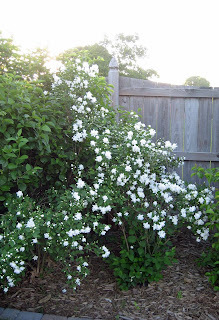 Here's a solution to your Charlie Brown shrub problem: grow a Clematis through it. If you get a Type 3, it will bloom after the Mockorange flowers have faded and the Clematis can be cut to the ground every year, so pruning the shrub will not interfere with the Clematis. My vulgar lilacs function as a hedge, so I don't mind that they don't look like much after they bloom; they're supposed to be invisible. This comment is also to let you know that none of your comcast email addresses seem to be working. I had to email someone else with a comcast address tonight and theirs isn't working either. Carol, I have the same problem. I can't cut down a blooming shrub or even pull out a blooming perennial that's seeded all over. Sometimes I will resort to taking lots of bloom cuttings and making big overblown flower arrangments but I usually have to be under some kind of pressure like a party or garden tour coming here. I can't cut down a blooming plant either. We have the same problem here with a lilac looking plain most of the year but it's worth it for the scent. 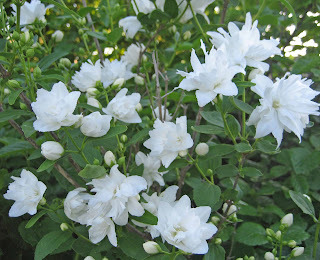 I love mock orange too and plan to plant one here; there was one at our old house and I'm missing the fabulous scent! I think there are definitely plants worth keeping for a short-lived but beautiful flower. They are a welcome signal of the season, and the more fleeting the flower, the more we appreciate it when it comes.